Ask Dr. Doni – How can my digestion have anything to do with my metabolism? A perfect example of how our bodies are intricately connected – is Leaky Gut. The walls of the intestines should only allow nutrients and water to cross – we definitely wouldn’t want viruses, bacteria or parasites getting through. But when our bodies are stressed, exposed to antibiotics, heavy metals, yeast and other possible culprits, the walls take on microscopic damage that allows undigested food to “leak” through the walls into the tissue where the immune system is on guard. Known medically as “intestinal permeability,” leaky gut then leads to an inflammatory response in which the immune system attacks food the way it would attack a foreign invader – with antibodies and cytokines – leading not only to local swelling and irritation, but also to a cascading message of inflammation that can land anywhere in the body, including the bladder, sinuses, and/or nervous system. What’s worse is when there is an imbalance of healthy bacteria in the intestine, combined with leaky gut, it leads to weight gain, metabolic syndrome (increased waist circumference and/or elevated triglycerides, high blood pressure and elevated blood sugar), as well as diabetes. Read about this research by clicking here. There are tests available to help us determine whether this is an issue in your case – so please let me know if you’d like to investigate further. What do you think of this research – can you see this type of connection in your body? Please do leave your comments below. DR. DONI WILSON is a Doctor of Naturopathic Medicine, natural health expert, nutritionist, and midwife specializing in gluten sensitivity, intestinal permeability, adrenal stress, and insulin resistance. She helps women, men, and children overcome their most perplexing health challenges and achieve their wellness goals. She does this by crafting individualized strategies that address the whole body and the underlying causes of health issues. She is the creator of The Hamptons Cleanse and author of The Stress Remedy: Master Your Body’s Synergy & Optimize Your Health. 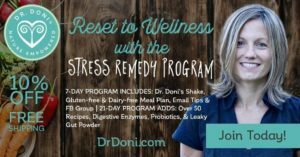 Find out how stress of all types affects your body at TheStressRemedy.com, and sign up for Dr. Doni’s Weekly Wellness Wisdom e-newsletter for tips to empower you and your path to wellness!